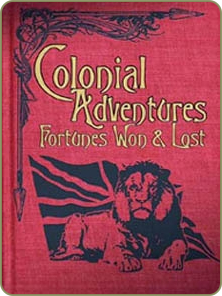 Two Hour Wargames have made their Colonial Adventures and Colonial Lemuria rulebooks available for sale for Wargame Vault. Colonial Adventures Colonial Adventures allows you to recreate these "dirty little wars" of European expansion on the tabletop. Refight the heroic stand at Rourke's Drift or try and change the result at Isandhlwana. But it isn't just about the British and Zulus. It's also about the French Foreign Legion, Berber horsemen, Imperial German forces, Masai warriors, the Russian army, Pathan tribesmen, and much more. Whether you're an experienced Colonials player or a novice just starting the period, Colonial Adventures is right for you. Colonial Lemuria What is Lemuria? Simply put, it's a source book that provides you with a complete continent to explore with both Colonial Adventures and Larger Than Life. But it's also our first step into the world of Victorian Science Fiction. Lemuria - land of adventure. Old when Eden was young, it is a land of secrets both ancient and new. It beckons travelers, both experienced and new. Lost civilizations, exotic people, and strange steam driven machines open the door to a world of wonder. Lemuria - where the established European powers of Colonial Adventure will vie with ancient peoples for control of the land and its people. To bring their bustling markets, mines, and gems under their control. Fight fierce desert warriors. Travel from steaming jungles to freezing mountains and beyond in search of great wealth.